Releases of water from Ruedi Reservoir into the lower Fryingpan River are getting more complicated and requiring greater coordination among agencies and stakeholders in both the river and the reservoir. Tim Miller, a hydrologist with the Bureau of Reclamation, which manages Ruedi, discussed “the difficulty of meeting everyone’s needs to their satisfaction” at a meeting in Basalt earlier this month. A ready example of the need for coordination can be seen today on the river. The current release of less than 50 cubic feet per second of water from Ruedi, due to the year’s low flows and relatively high releases, is making it harder to maintain operations in the hydropower plant at the base of the big dam on the Fryingpan. But, a recently amended lease of 3,500 acre-feet of water between the Colorado Water Conservation Board and the Colorado River District could bolster the low flows. But that lease does not start until Jan. 1. Once it does start, however, that same lease of water could also provide higher flows through the rest of the year for the benefit of endangered fish in the Colorado River, which is a good thing. Ironically, those higher releases may not be a good thing for anglers below the reservoir struggling to wade in higher water, or a good thing for sailors at the Aspen Yacht Club, struggling to reach their docks as reservoir levels fall. It’s all part of the new flavor of sauce bubbling up on the Fryingpan as the water in Ruedi, which holds 102,000 acre-feet, is now being used more often by more parties for more reasons. And low water this year is presenting fresh challenges. In addition to the regular releases from Ruedi of “fish water,” which are designed to benefit endangered fish in the Colorado River near Grand Junction, a lot of water was sent out of Ruedi this year from other pools of water held in the reservoir under varying contracts. 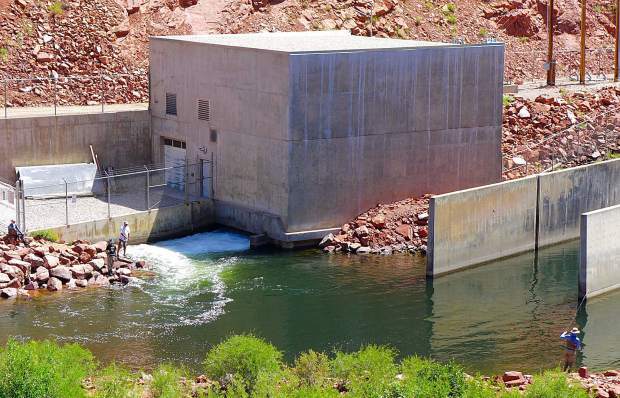 In 2018, there were 19,496 acre-feet of “fish water” releases, and another 11,608 acre-feet of “regular contract releases” from Ruedi, according Reclamation. That totals 31,105 acre-feet of water released from those two categories, which is well above the 21-year-average of 19,167 acre-feet. Now the low flows of 2018 have forced Reclamation to reduce releases from Ruedi so the agency can meet its goal of filling the reservoir again by July 1. On Friday, the Fryingpan below the dam was flowing at 41 cfs, and the river has not been above 50 cfs since Oct. 19. And that’s causing problems for the City of Aspen’s hydropower plant, which sits at the bottom of the dam. At the Nov. 8 meeting in Basalt, two city officials, Margaret Medellin, a utilities portfolio manager, and Rob Covington, a water resources and hydroelectric supervisor, brought up their concerns. Linda Bassi, the chief of the CWCB’s stream and lake protection section, told the directors of the CWCB last week about the various concerns voiced at the Basalt meeting. She also told the CWCB board that as result of the meeting a new more flexible standard would be used regarding target flows in the lower Fryingpan, which have previously been set at 300 cfs to 350 cfs in an effort to maintain optimum “wadeability” in the river for anglers. And she noted, the state will also be coordinating with the Bureau of Reclamation and the Colorado River District on the releases. Aspen Journalism is covering rivers and water with The Aspen Times and other Swift Communications publications. More at http://www.aspenjournalism.org.